A warm welcome awaits you at our Edinburgh guest house for either short overnight stays or longer more leisurely breaks. The Ascot Guest House offers comfortable, affordable accommodation to suit all budgets. An excellent exploring base well located for Edinburgh's main attractions. Edinburgh Castle and the Royal Mile only a twenty-minute walk away. We have a free car park, free on-street parking nearby and a great bus service to Edinburgh's centre on the doorstep. Delicious full Scottish breakfast included, free wi- fi in rooms. All rooms have comfy beds, Freeview TV, hospitality tray with tea, coffee, hot chocolate, butterscotch and biscuits. Most have fantastic views over Edinburgh. The Ascot is a Victorian house of great character. A warm welcome awaits you at our Edinburgh guest house for either short overnight stays or longer more leisurely breaks. 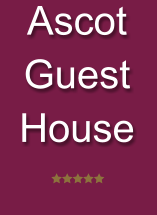 The Ascot Guest House offers comfortable, affordable accommodation to suit all budgets. An excellent exploring base well located for Edinburgh's main attractions. Edinburgh Castle and the Royal Mile only a twenty-minute walk away. We have a free car park, free on-street parking nearby and a great bus service to Edinburgh's centre on the doorstep. Delicious full Scottish breakfast included, free wi-fi in rooms. All rooms have comfy beds, Freeview TV, hospitality tray with tea, coffee, hot chocolate, butterscotch and biscuits. Most have fantastic views over Edinburgh. The Ascot is a Victorian house of great character.